The paradox of trying to please other people is that the harder we try, the less it works. On the other hand, if we concentrate on the problem, think through the various options that are available and protect our rights and feelings by being assertive, the chances of dealing with the problem effectively increase enormously. If we succeed, our self-esteem rises and so does our confidence about handling this sort of problem. These positive feelings and this confident outlook are transmitted in various ways to others, who begin to look at us in a new and favorable light. Someone who has seen an alcoholic making a mess of things for many years is almost always impressed by this new, confident person who handles day-to-day affairs efficiently. As assertion and problem-solving involve consideration of the rights of others, there is no way it can validly be shown to be a selfish, self-centred approach. Marion worked in middle-level management and was always doing things to please her superiors but she also succumbed to the wishes and demands of her subordinates. In time, both her superiors and subordinates came to see her as a vacillating, indecisive executive. Even though she thought some of the practices of her superiors could have been improved, she never volunteered suggestions for such improvements. Even though she could see that certain employees were failing to control their sales teams, she said nothing directly and honestly about it, because of her desire to please everyone. Consequently, feelings of pity, irritation and disgust were voiced by superiors and subordinates and statements such as “for heaven’s sake, say what you mean. How can we carry out the management’s policy if we don’t know what it is?” Once Marion learned how to be assertive, her life changed and she won the respect and admiration of family and friends. She also changed her career and is now working in high-level management. Within families, alcoholics who feel they have lost the right to be assertive, effectively stifle communication by trying to please and resentment about this may grow. The temptation by both friends and family members and the alcoholic will be to blame the problems on the alcoholism whereas this is a common problem in many families where someone is non-assertive. Conflict arising from failure to resolve dependency needs causes the anger and depression that leads some people to begin abusing alcohol. Undoubtedly infants are completely dependent on parents and other adults from birth for physical needs such as food, liquids, shelter and warmth. Apart from this physical dependency, there is clear evidence that there is also a psychological dependency, which shows itself from birth. Children brought up in a home where there is an absence of handling, of bodily contact and psychological warmth may fail to develop physically, emotionally and mentally. 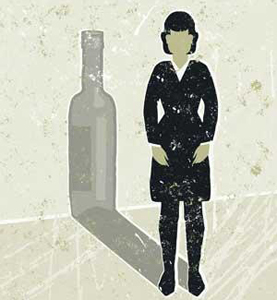 Adult children of alcoholics suffer with low self-esteem, confidence and do not know how to stand up for themselves. Hence, they turn to the bottle for comfort in times of loneliness, isolation, guilt, remorse, shame and disgust at their own inability to stand up for what they believe in. If all of the above is a bit too close to home and you would like some help to de-stress before you make the commitment to change, I suggest taking some [products]8540-Mood Food[/products], which is necessary for the manufacture of dopamine and noradrenaline, which are required for concentration, alertness, memory and a happy, stable mood. [products]8540-Mood Food[/products] is also needed for the production of enkephalins, which are substances that have pain relieving effects the body. [products]8540-Tyrosine[/products] can also relieve emotional pain as we are often very sensitive people. [products]8540-Tyrosine[/products] is also required for the manufacture of thyroid hormone and the manufacture of adrenalin in the adrenal glands. Are you suffering from adrenal exhaustion? [products]20055-Magnesium Ultra Potent[/products] can be taken before bed to assist with a deep and restful sleep. [products]20055-Magnesium[/products] helps to reduce stress and is great in preventing muscle cramps. I used to get spasmodic muscle cramps at night until I started taking Magnesium – haven’t had any problems since.